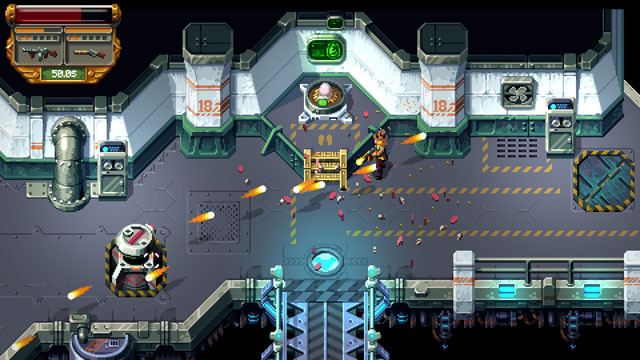 Tower 57 is a colorful isometric top-down shooter from Pixwerk. The game is set in an 1920's art deco style "dieselpunk" world where people live in huge towers above a radioactive wasteland and are constantly at war with another. You discover that Tower 57 is planning an invasion, and you set out to put a stop to it, along with a friend if you like, in 2P offline co-op. Players have access to a wide range of weaponry, including Tommy guns, shotguns, lasers, electricity beams, rocket launchers, and flamethrowers as they take on robots, turrets, and even the occasional tank (and maybe even drive one!). The wasteland is dangerous, and it's even possible to lose a limb during a fight, although there are terminals selling replacement prosthetics... but losing both arms leaves you unable to hold a weapon. The game is now available for PC, Mac, and Linux via Steam and Humble Store, and is coming to PS4 via PSN in Winter of 2018, with releases also planned for Xbox One and even Amiga OS. Check our coverage here.